00:40 jas_ is it a one-shot? if i waited would it work? 08:38 jas_ so, you're able to determine whether the client right-clicked off a stack? 08:41 jas_ OH you can get player_controls() and see them right click off the stack?? 08:47 jas_ something you think might be appropriate for the core? 08:48 jas_ you use a sql db? i dunno what that means exactly. i know there's sqlite, but, what about this new ModStorage store? 08:48 jas_ i think maybe it's 0.4.17 only? 08:50 jas_ so i take it because of the external lib, this wouldn't make it into core? 08:58 jas_ do you know what the current stock latency is? 08:59 jas_ oh ok. well that's 200%!! haha, still seems small. is it even noticeable to you? 10:07 Raven262 Did you hit him after that? 10:19 Megaf Usually I have my bike headlight flashing all the time. Today I didnt have it mounted on my bike. Learned a less. 10:20 Megaf Anyone here on Strava by the way? 10:25 Megaf the driver did stop and stayed there with me. He was calm and willing to listen and help. 10:35 Raven262 I would do the same. 10:35 Raven262 Not sure if it is the right thing to do though. 10:46 shivajiva Megaf you always take name and numberplate, if they admit liability you can claim, should anything show up in the immediate future relating to the accident. This is why we need insurance to drive a vehicle after all. 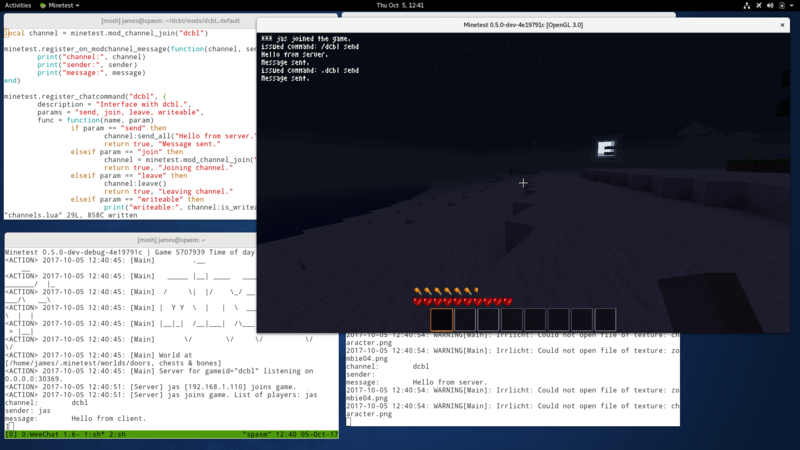 11:13 rubenwardy Krock, maybe # minetest @ freenode.net? 11:15 sfan5 >"this is work in progress"
11:17 jas_ why don't you show off sofar's itb website to demonstrate the different ways minetest is used? 11:18 Krock voxelands, as an early spin-off? 11:21 rubenwardy don't spill wine on it too! 11:34 IhrFussel So what will happen if I send a colorized chat message from the server to a client that doesn't support them? Will it displays garbage in the chat for them or just ignore the sequence? 12:01 shivajiva Cal, you should consider doing advance driving if you want to stay on form, it helps immensely too understand what goes on when the vehicle loses grip with a surface and teaches you the maxim of looking further ahead. 12:11 IhrFussel nerzhul, yes but wouldn't gdb backtrace give more info about where the packet originated? 12:29 jas_ i was having problems playing sounds. there's a brief mention of it in client_lua_api.md, but it would only play sounds off the server, not local ones. 12:39 IhrFussel Is running a MT server "multimedia"? -> Obtain an official certificate in order to use this track in a video or multimedia project. 13:51 jas_ so i'm onto something here? 15:22 Krock jas_, still segfaulting? 15:51 jas_ dunno if that's because of poor programming. i didn't reference anything when i wrote this. 15:52 jas_ but i also don't have a writeable channel. i get the channel, but is_writeable() is false on client, but it's true OK on server! 15:56 jas_ Krock: i just attempted to load preview mod, but it errored. can you confirm that works? 16:32 jas_ things are working! it's so nice!! 16:50 sofar does everyone think that mod channels are for chat stuff? 17:00 IhrFussel Can I tell gdb to display the executed lines as the program runs? 17:06 jas_ sofar: i think mod channels are for interacting between client and server mods. but chat commands are a good way for me to start, and learn how to use them. 17:27 IhrFussel gdb only tells me the same as in the chat "m_string = L"2017-10-05 19:21:51: ERROR[ClientConnectionThread]: Huge packet awaited, size: 349198306","
17:29 IhrFussel nerzhul, is it possible to add some more info about the packet to the client error? 18:02 IhrFussel nerzhul, so the client just *thinks* there will be a huge packet? 18:34 Fixer nerzhul: have you looked at "client disconnected" crash? 18:57 rubenwardy is it possible to make systemd write to a different file on each restart? 18:58 sofar you mean log output? 19:06 rubenwardy any ideas, sfan5? 19:33 TommyTreasure seems that the github/minetest branches all point to the identical url for clone. 19:36 ShadowBot Another satisfied customer. Next! 19:36 TommyTreasure lol, love the bot! 19:44 sfan5 rubenwardy: does it work now? 20:26 Calinou TommyTreasure: did you "cd" into the repository folder first? 20:37 TommyTreasure birthday -- 67 years of pumping blood! 20:40 TommyTreasure lol. just last month i showed up at a show, and realized i had forgotten my bass amp. 21:22 IhrFussel Will it also fix the huge packets or not yet? 21:24 IhrFussel In casee no and if possible maybe add to the "huge packet awaited" error more info about those supposed packets? 21:44 Fixer nerzhul: what about that client disconnected thing? 21:44 nerzhul Fixer, which ? 21:44 Fixer nerzhul: crash with "player disconnecteD"
21:45 nerzhul client or server crash ? 21:46 nerzhul you have that problem everytime ? 21:47 nerzhul did you update your local repository with latest fresh sources ? 21:47 Fixer nerzhul: had it on "Forget to protect UDP callback, but also factorize lambda between UDP"
21:48 nerzhul what is your compiler? 22:43 IhrFussel !tell nerzhul I just got the new error message "Reading header with less than 4 bytes"
22:52 IhrFussel Fixer, Did you receive that error yet?